Jungle, Mystic, Statues, Ponds, Rivers, Small Waterfalls, are just a few words to describe the Magig Garden as well known as the Buddha’s Garden. 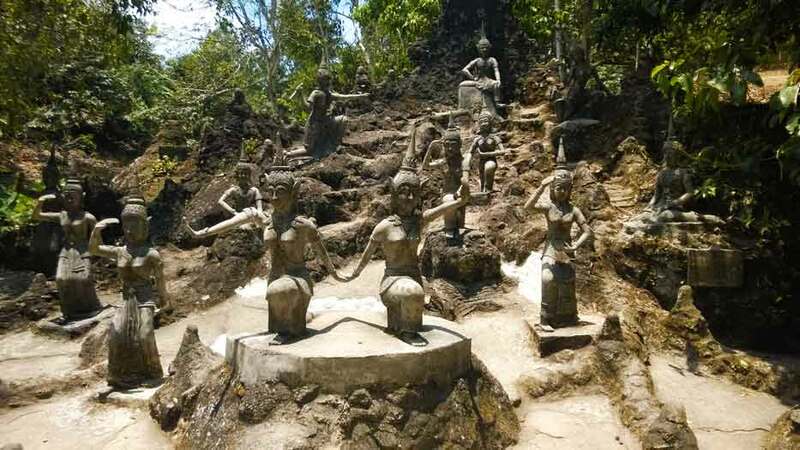 The Secret Buddha Garden, hidden high away on the top of Pom Mountain (Khun Nim Peak) of Koh Samui and was created by Ta Nim, an old Samui fruit farmer. In 1976 with the age of 77, he spent his last years of his life seeking to create a wilderness garden, filled with statues from the Ramakhian, a cycle of legends, based on the Ramayana. The mystical valley gives you a mysterious and completely different experience from anything you have seen before on Koh Samui. The garden includes many statues of Buddha, birds, snakes and other animals. They all look very realistic and you always have that uncertain feeling that each movement is watched and that you are not alone. There are so many statues that you have to come here not only once or twice to see them all. Some of them are hidden or camouflages by the greenery around them. The main group (Picture) shows a number of angel and musicians. He created a statue of himself, holding hands with his father as well. You can ask yourself, what was his motivation to create this garden. Was he just recreating his favourite story connected with some pleasure? Or did he believe in the existence of these “things” and wanted to honour them, or was afraid of them? You cannot answer this question, but whatever you believe, it is worth a trip to go in the mountains and visit the Magic Garden. Maybe you will find the answer.